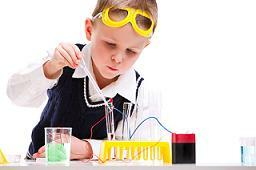 Fun science activities do not have to be complicated in order for children to learn. More often than not, it's the easiest experiments that are the most fascinating. All of the fun science activities in this section can be used alone or as part of a theme. Either way, children are fascinated learning about the way the world works. Use the easy science activities listed below to enhance the curriculum in your home based daycare. Cut an empty clean milk jug in half, discarding the bottom half. First talk in a normal voice, and then talk into the top of the milk jug. Your voice will be much louder. That’s because the milk jug makes all the sounds waves go in the same direction. All objects fall at the same speed. Heavy objects do not fall faster than lighter ones. Try this yourself. Use a shoe and a Styrofoam ball. They’ll both hit the ground at the same time. Place one cup of cornstarch in a bowl. Slowly add one half cup of water colored with food coloring until you have the consistency of thick pancake batter. This is a fun science activity that will hold children’s attention longer than you would suspect. Based upon how you use it, this is either a solid or a liquid due to suspension. Holding it in your hand, its molecules will line up and it feels like a solid. Let go and the molecules relax, turning it into a liquid..
*Prepare in advance as this is one of those fun science activities that can get messy. Find your pulse on your wrist. Place some modeling clay on the area directly over the pulse. Place a straw upright in the clay. The straw will move with every beat of the pulse. This is a neat use for straw wrappers. Tear off just the tip of the wrapper. Hold one end of the straw wrapper and slowly push the wrapper down the length of the straw. Keep going until the wrapper is tight and you can’t push anymore. Remove the straw. Put one drop of water onto the straw wrapper and watch what happens. Place some water colored with food coloring in a clear plastic container. Add oil. The oil will stay on top of the water, because the oil is lighter than the water. Place the container in the freezer for a few hours. When you remove the container you’ll see that the oil is now underneath the water. When water freezes it becomes a solid making it less dense than the oil, therefore the water rises to the top. Place two stacked napkins on a small plate. Pour vinegar on the napkins until they are soaked. Place a penny on top of the napkins. Leave for a full day or two. The copper in the penny will mix with the oxygen in the air to make copper oxide. Because of this, the penny will turn green. Show how you can tell if an egg is raw or hard boiled without cracking it. Use one egg of each type, and spin them. The raw egg will wobble; the hard boiled egg will spin easily. Due to the tendency of an object to continue at rest or in motion (inertia) the raw egg will wobble and continue to move even after you try to stop it. The hard boiled egg which is more solid will stop quickly when touched. Comb your hair about 20 strokes with a plastic comb. Turn a faucet on so there is a slow steady stream of water. Place the comb very close (but not touching) the water. The water will bend toward the comb. Stuff a clear glass or plastic jar with cotton batting. This will create a nice white background making it easy to see the development of the beans. Soak beans overnight. Slide the beans between the batting and the outer edge of the jar. Keep the batting moist all the way to the outer edges. In just a few days you should see the beans sprout. Try putting in just a few beans per day. In this way you will be able to see several stages of development. Wait until you see both roots and leaves, then turn the container upside down. The roots and sprouts will change direction. Place an orange in a bowl of water. The orange will float. Let the kids try to push on the orange to make it sink. Peel the orange and place it in the water again. The orange will sink. Use a tall clear drinking glass. Place ½ cup of honey in the glass. Add ½ cup of oil. Add ½ cup of water. Let the three substances settle. Then (one at a time) add items to the glass. Try a coin, a grape, and a cork. See what happens to each of the items. Fill a large bowl half full of water. Make a ball of play-dough and place in the water. It will sink. Remove the ball of dough and shape it into a boat. Place the dough boat in the water. Now what happens?